We got three machines form KONSON,the machine is good quality and they provide service of installation and debugging. I imported 80,000 sets gabion boxes.The products and marketing team are both excellent.The gabion got a good mark in quality test. CE, ISO9001, SGS, ASTMA, EN, BS standard. 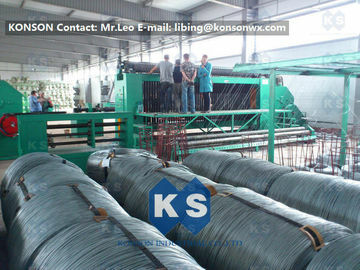 KONSON brand Gabion machine is designed to produce gabion mesh for various widths and mesh sizes. Konson brand Gabion Machine is one kind of special equipment for twisting metal wire hexagonal mesh with big wire, large mesh and wide breadth. The product has widely function, with its good corrosion resistance and oxidation resistance, it serves well as strengthening, protection and temperature keeping materials in the form of mesh container, stone cage, isolation wall, boiler cover or poultry fence in construction, chemical, breeding, garden and food processing industries. honor to provide the Gabion machine. All of the core parts of machines are processed by our own factory, the quality can be ensured. The gabion mesh machine adopted PLC automatic control, hydraulic pressure, circulates steady, with low noise and high efficiency. Welcome your any inquiries! Our company KONSON exported machines to foreign countries and provide after-sale service. We could also help customers to repair machines from other suppliers. China Good Quality Gabion Machine Supplier. Copyright © 2015 - 2019 gabionmachines.com. All Rights Reserved.